The City of Palm Coast Water Distribution Division has approximately 675 miles of water transmission lines, with the largest portion being within the city limits. The Water Distribution Division maintains and installs water lines, fire hydrants, isolation shut off valves, water meters and backflow prevention devices. The water lines range in size from 2" through 30" and are made of either Poly Vinyl Chloride (PVC), Ductile or Cast Iron, High Density Poly Ethylene (HDPE) or Asbestos/Cement (A/C). The Water Distribution Division also performs various functions such as reading residential and commercial water meters every month, turning water on or off, checking for leaks and rereading meters. As part of the Public Works Department it has personnel on-call twenty four (24) hours per day seven (7) days per week to respond to emergency water line leaks. There are three sections within the division: Construction Section, Maintenance Section and the Meter Reading Section. As new homes are constructed, this section installs the water service line, water meter and the backflow prevention device. This section installs or repairs fire hydrants, isolation shut off valves and backflow prevention assemblies. When a water leak or damage to the water line by a contractor occurs the Construction Section performs the repair and restoration of the area. This section also maintains over 7,155 isolation shut-off valves for the water distribution system, raw (non-processed) water system and the waste water collection system. This is accomplished by operating the valve and recording the number of turns in both directions, and cleaning the access valve tube, The street is also marked with location tabs and the valve position plotted in a valve location book and the Global Positioning System (GPS) location number recorded on the master map system. As part of the continuing maintenance this section replaces older deteriorating water service lines and installs new radio reading water meters, a backflow preventer and upgrades the meter pit. This Section performs work orders issued by the Customer Service Division for turning water on or off for customers, rereading meters and checking for leaks, high water bill complaints and various investigations into customer related problems. The testing and repair of the City's backflow prevention devices is performed by this section's certified technicians. Residential water meter accuracy testing is performed by this section as well as the coordination of large commercial water meter accuracy testing by a contractor. The Maintenance Section also performs Utility Final inspections as part of the new construction process for homes and commercial buildings. This section currently reads approximately 43,500 meters (residential, commercial, industrial, reuse and fire line) in the water distribution and reclaimed water systems. The meter readers average approximately 2,175 meter readings per day. The meter readers also make notes for any deficiencies of the meter and the meter housing box, so maintenance can be scheduled at a future date. 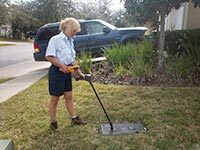 The meter readers also perform various investigations for customer service and perform meter pit maintenance. The City recently purchased a new advanced automatic meter reading system (Radio Meter Reading Technology). This system improves accuracy and reduces the time required to read the meters. This system it is designed to perform a meter diagnostic while reading the meter. The meter readers also replace meters that have a scratched glass lens, that are 15 years or more years old (Accurate life span) and replace the older manual reading meters to electronic encoded register meters so they can be converted to touch read. Once an area has been converted to the new meter, it is then scheduled for a transmitter to be installed. This enables the route to be read via a truck mounted radio reading system. Our goal at the Utility Department is to continuously improve work efficiency and overall customer satisfaction. Communication between the Utility Department and contractors plus suppliers is vital to our operation's success. When an application for new water service is submitted, it is imperative that a plot plan of the house on the lot is provided to preclude the meter from being installed in a conflicting location such as a driveway. First and foremost, the lot must be cleared with survey pins and lot identification stakes in place. The two front corner lot lines must be clear of all obstructions including dumpsters, building materials, portable toilets, temporary power poles, natural vegetation, etc. If the grade of the lot is to be changed after the initial clearing the contractor must notify the Water Distribution Department. It is recommended that the two front lot identification stakes have a final grade mark on the stakes. Once this is complete, the contractor will go to the City website and in the Utility Section then click on the Customer Service tile. In the Customer Service Section scroll down to Online Forms and click on the Meter Request form then fill out all the lines and submit. We ask that you plan in advance to avoid problems or conflicts. All City meters have a leak detector on the meter dial face. The Sensus manual reading meter has a white triangle in the center of the dial face, the Sensus electronic register meter has a 3/8" hole in the dial face with a black line on a red background and the Neptune manual meter has a red triangle in the dial face. When ever water is flowing no matter how small of a quantity the indicator will move. To check for a leak, first make sure there is no water being used, then check the leak indicator on the dial face, if the indicator moves clockwise then that indicates water is flowing through the meter. Toilet flappers are one of the most common causes of high bills. When the rubber starts to warp and does not make a good seal on the seat ring, the water in the tank slowly drains which causes the fill valve float to fall and refill the tank. Pin hole leak in PVC line going to the house. A hole size of a 1/16" in diameter leaking 24/7 will lose 24,600 gallons in a month. My meter seems to read fast. Why? The existing meters are displacement meters, which means that the water physically has to pass through the meter and turn a piston before it will register. Meters historically read slower (customer receives more water than they are billed) with age because at approximately 8-10 years of use the piston assembly starts to wear and allows more water to pass through the assembly than is recorded. The City is transitioning to remanent magnetic field technology meters which can measure very low flows as well as very high flows. The new meters have a data logger which records water consumption for over 30 days. 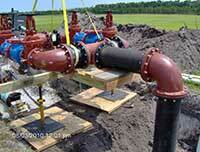 What type of backflow preventer is required for an irrigation system? The accepted backflow assemblies are a Pressure Vacuum Breaker or a Reduced Pressure Zone Assembly. This is due to the degree of hazard per the Florida Administrative Code 62-555.360.